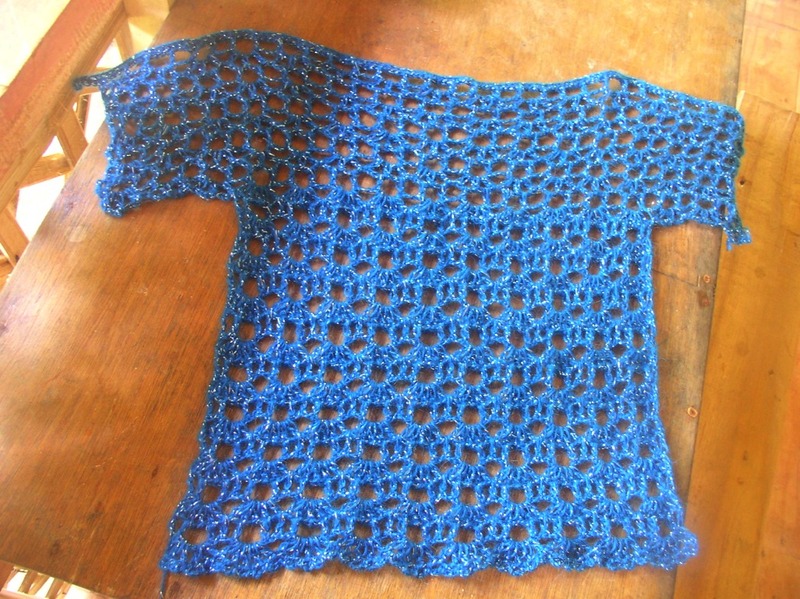 Crochetology problem: Given an openwork pattern (below), use and alter the pattern to construct a simple shape for a ladies’ blouse. Try to design a garment shape (pattern) that uses no increase and decrease to achieve shaping. Here (below) are 2 openwork patterns from Duplet 112 that you can try to play with. I used the first sample. For this Crochetology problem I selected an openwork pattern from Duplet 112. 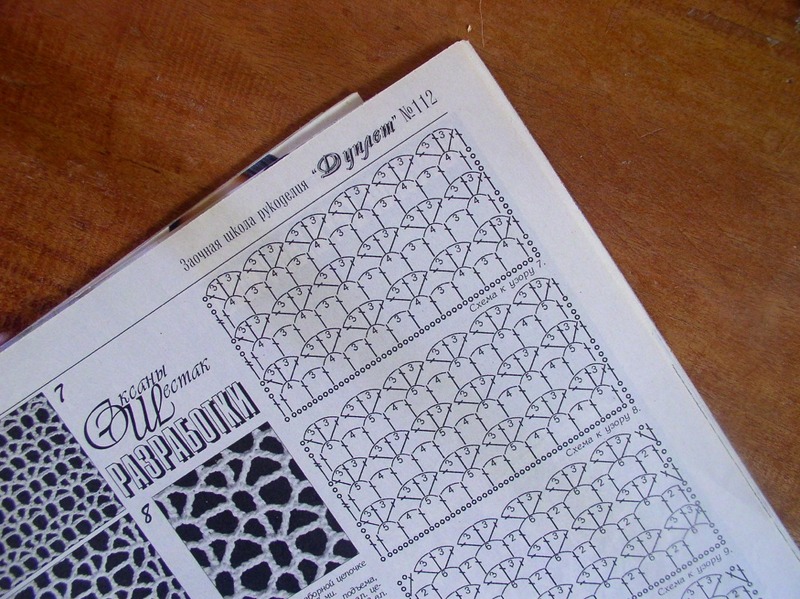 Now the challenge is to use this openwork pattern this time to make a lace blouse. Start with a simple blouse: loose fitting, short sleeves, boat neckline. Take a closer look at the pattern and decide what type of yarn would be the best to use. Should it be thick yarn, thin lace yarn or thread? Should it be solid colour, varied colour? What fibre should I use? Wool? Cotton? Acrylic? Blends? Why? In what climate and occasion do I plan to use this garment? How does that affect my choice of yarn weight and fibre content, and colour? Is the yarn stretchy? Resilient? What quality of yarn is best for this openwork lace pattern? 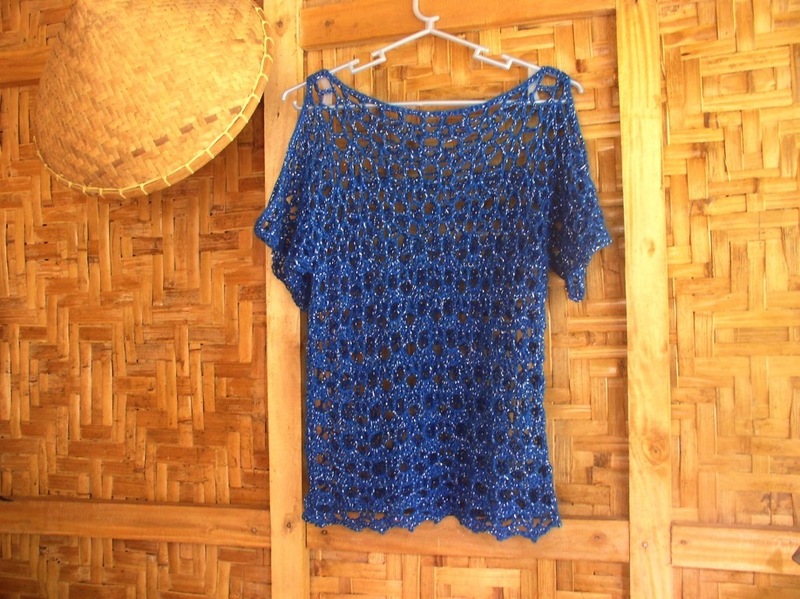 What quality of yarn is best for a simple basic garment shape with no increase or decrease to achieve shaping? Does this mean a shape that is loose (has positive ease) on the body? Or should I make a fitting shape? 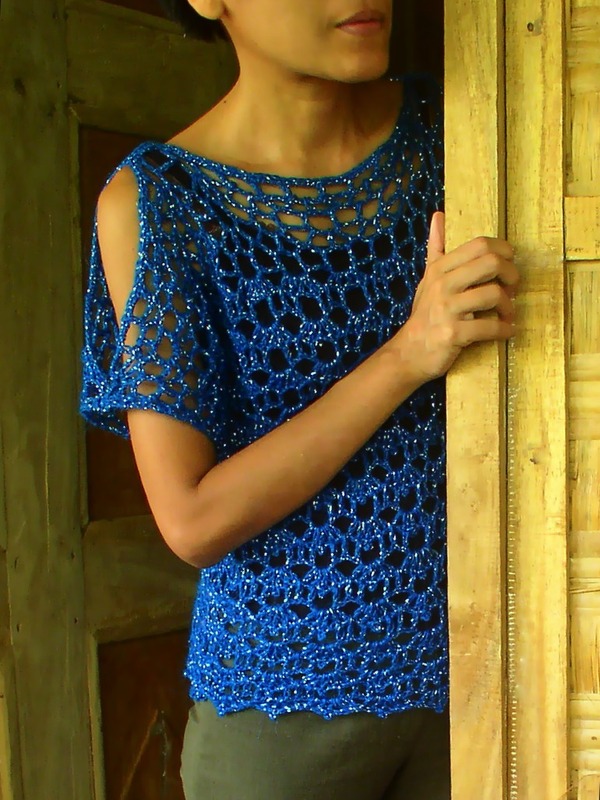 Would that look good with this type of openwork lace pattern? How should I alter the basic pattern? Should there be more holes, more cover? Which part of the blouse should there be more holes? More cover? How will altering the basic openwork pattern work with a basic blouse schematic? 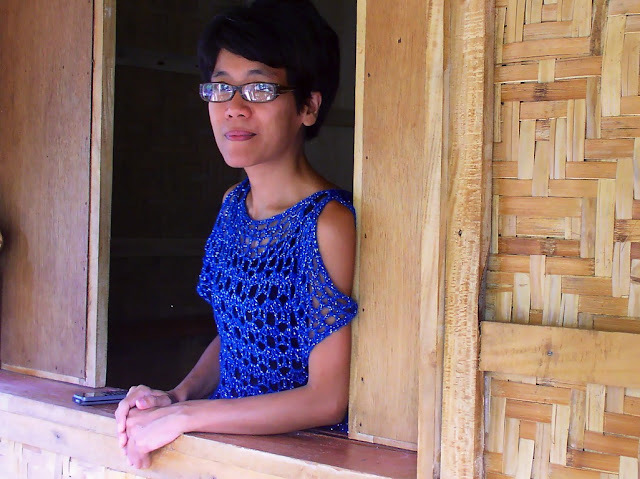 Here’s a blouse (above) that I made as solution to Crochetology Problem: Simple shapes, simple alterations. I have found a really simple schematic that employs no complex shaping. I have also found at least 3 alterations to the basic openwork pattern. If you have tried solving the Crochetology Problem, do share your results! I will be making another design solution, this time for a dress. In the meantime, here are some progress photos. 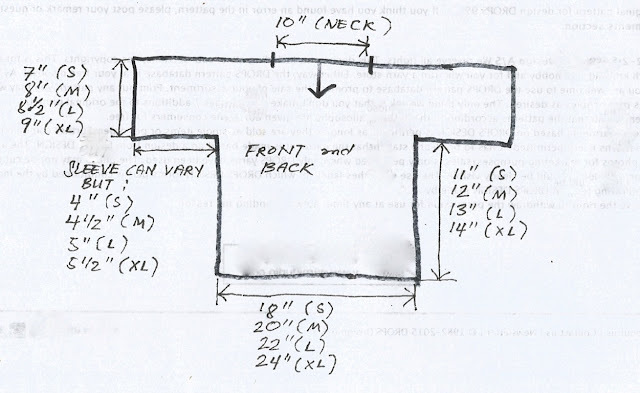 First, I made a schematic (above) showing the shape I need to make and the measurements. I am making a blouse for myself, size Extra Small. 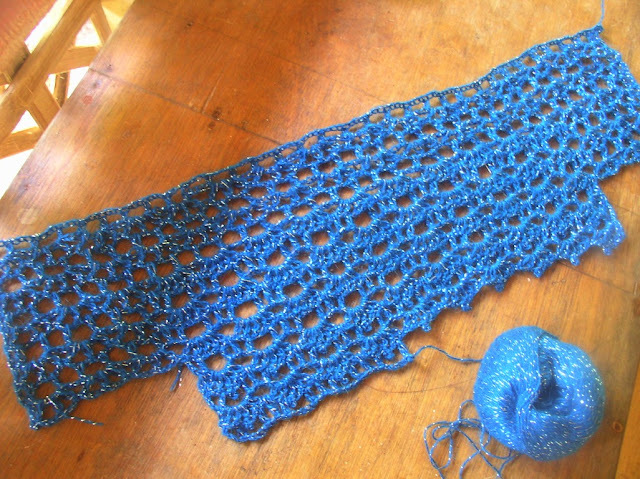 I am using 3.5mm hook and Sport / 5 ply (12 wpi) yarn in blue colour with metallic strands. I made the top section first, a rectangle making up the neck, shoulder and sleeves. I fastened off then joined to make the lower part of the blouse, continuing the work downwards. I made two of these and joined together at the side seams and the shoulders and sleeves. I made gaps at the shoulders for a cooler and loose garment suitable for summer. And here (below) is the finished blouse! It is so quick and easy and can be finished in one evening! The length of the sleeve can vary. Glittery yarn make for a nice evening wear, and cool cotton would be great for the daytime. Experiment with colours too. Mix and match stitch patterns! Love the color and everything about this blouse... Just beautiful!